Yes it's February and we should be dishing on all things L-O-V-E, but this year we are going to switch it up a bit. 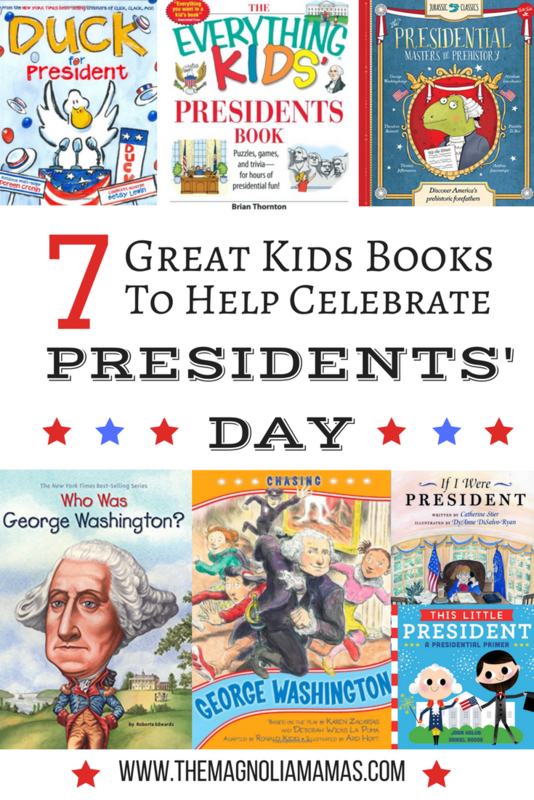 In year's past we've used this month's children's book club to share all about our favorite Valentine's Day books and activities, but we've always overlooked that other major holiday in February - Presidents' Day! Over the last year or so our children have heard more than their fair share of all things Presidential. We keep our politics to ourselves, but you can't shield those little ears and eyes from every single thing. Those tiny ears hear everything. So today we are taking a break from all the adult political chaos, and put a little positivity out there for our pint sized future voters. We've done the research and come up with some fun and factual presidential reads for our future little leaders! This Little President - A fun little rhyming book for our tiniest of future American leaders. This adorable little book give your reader a peek at ten of our most notable presidents across history. Duck for President - Part of the Click, Clack, Moo series that young readers love everywhere. A silly story of that wacky Duck and his path to presidency. If I Were President - A quick, yet broad peek at the branches of government and the duties that they president holds. The Presidential Masters of Prehistory - This one is for your dinosaur loving little ones. This fun book takes you on a prehistoric presidential adventure with all of your favorite presidents. Thomas Jeffersaurus is always a huge hit! "Who Is..." Series - The "Who Is..." series is perfect for older elementary school readers and gives a more in depth look at some of history's greatest and most influential leaders. With books on George Washington, Thomas Jefferson, John F. Kennedy, and even Barak Obama - there is a little something for everyone. The Everything Presidents Book - An interactive book that takes the lesson one step further with fun games, puzzles and more! Chasing George Washington - A fun presidential style adventure for older elementary school readers. Follow students on a wild chase as a White House tour turns into something a little bit more. Do you have a favorite kids book for President's Day? Or a fun book to help kids learn about politics? Share it with us!